I had a student come into my office (where I was a visiting mathematics professor) shaking with emotion. This was a day or two before the final exam. I couldn’t remember her name, because I had only seen her intermittently in class during the semester. She never came to the office before. Her story was sad and long. She needed a B, she explained, to save some kind of scholarship or status about which I retain no memory. Had to do with money, anyway. That’s when the tears started. Not sadness. Rage. She was furious. “I never had a math professor give me anything other than an A before,” she warned me. I wanted to say, “You have one now,” but I chickened out. I went instead for a change of subject. “What classes were those?” Meaning I was curious about their level and content. She then launched into a lecture telling me of all the grades she got in high school and other college classes. All As. I was then informed my classes were too hard and that nobody could do well in them. My big mistake came in suggesting that she might have worked harder and that now was a little late in the game to try to make things up. She left saying she was going to complain about me. To whom I don’t know. I’m sure she got at least partial revenge on her teacher evaluation form, rating me low, low. Now these are frightening things to a professor. We must, the general contention says, keep our “customers” happy. And what better way than to give them the grades they desire? But really, as the semesters wend their laconic way, most of us don’t really think much about these. We all know you can’t make everybody happy. Allison Schrager, author of “Confession of an Ivy League teaching assistant: Here’s why I inflated grades“, agrees. Teaching evaluations are only a minor annoyance. Typical. Professors battle grade grubbing like Chinese buffets fight off cockroaches. An endless annoyance, increasing in intensity as time goes on. I recall half-joking with a colleague of my plan to offer the students of one troublesome course a C if they promised to not come to class, or they could stay and receive whatever grade they earned. I thought this brilliant, but I was talked out of it. The colored lines are smoothers (averages), which can be ignored. The general trend is clear: over the schools they sampled, grades marched ever upwards. A bump in the late 1940s after the war (ask your freshman if they know which one) and the enormous rise corresponding to the beginning of the decline in earnest of the West in the 1960s. And the final surge to the pinnacle which, at least at some institutions, is now occupied by nearly all students. Proof? Didn’t we read “Substantiating Fears of Grade Inflation, Dean Says Median Grade at Harvard College Is A-, Most Common Grade Is A“? I have some sympathy with Schrager’s position. If you’re concerned about your academic career, better to spend one’s time writing grants and papers then in falling into the black hole of time sinks arguing with some overly earnest student why he received an 88 instead of an 89. The attitude creates the vicious cycle where one professor is tempted to “go high” because they others at his institution do. And why be bothered when the grant submission is due—and they are always due. Well if the student wanted watered down grades why didn’t she attend Easy-A University (EAU)? I once had a student tell me what the answers to my exam questions should be and how she should get more marks, because she answered “in the spirit of the question”. I laughed a her. Same holds true for other things in “academics”. I was removed from science fair judging because my co-judge marked down a student for using the tired volcano of vinegar and baking soda experiment. No student was ever to marked down–he knew this, but did it any way. Neither of us were asked to return. One state fair contestant included Sunny D in her comparisons of “orange juice”. Apparently no one was allowed to mark students down at her school either. The most disturbing part was it was at state level–the best of each district. One day people will end up dying because their pharmacist got all A’s but really can’t tell one drug from another nor does he/she know their side effects and interactions. We already see this in graduates of police academies who then go one to do the most irrational things in the field. Guess no one considered that grade inflation would only add to the “stupid” in the world. The problem with grade inflation is that the stupid starts at the top. Trickle down stupid. Universities could just hand out 4.0 GPA diplomas after cashing the tuition check. No need to attend classes at all and, therefore, no need for ivy halls, expensive labs, or professors. Every kiddie would be happy and, without all that overhead, just think of the profits. But all the kids in college are so smart they all make A’s. I don’t think that we have this kind of problem here in Canada, or at least in Quebec. I have to admit that we have little incentive to do it, since prof are not paid by the result of their classes and scholarship only require to pass classes. Even though presence are not taken, student who don’t attend class or miss evaluation will have a hard time finding any sympathy in their teacher. On the other hand, student who do the work will find a helpful teacher. This claim is somewhat ridiculous. the 1960s saw a huge rise in every standards of living. Very difficult to claim that the decline started then. Ray, that has to be the worst possible answer. The teacher should be teaching the students as much as they can reasonably learn, to do less is depriving the students of the education they are paying for. However in a class of over 10 students at least one is going to be going through an unreasonable personal crisis (mother died, bad break-up, discovery of ecstasy or similar) which prevents them from learning that much. Because life, and especially the life of college students, isn’t confined to being reasonable it is improbable to the point of absurdity that an entire class would be capable of learning completely a reasonable amount of material. If you are saying that students in Canada only have to pass a class to keep a scholarship, how would get around a teacher needing to pass a student who was actually flunking but was horrified he/she would lose their scholarship? If most students get B’s and A’s one would suspect grade inflation. How many people in classes you take get B’s and A’s? The B+ grade is reserved for students who have committed assault. That graph looks very much like one for the number of persons attending college. 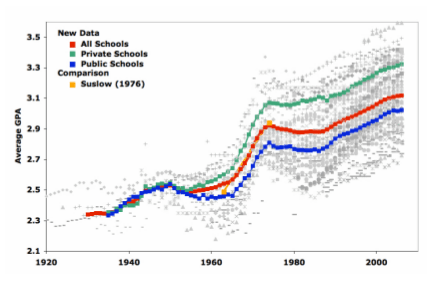 I wonder how much grade inflation resulted just from the influx of baby boom students during the decade beginning about 1965? Many new professors were hired to handle the hoards arriving on campus and they were freshly minted PhDs in the boom’s vanguard. I suspect something more than careerism was in play. They came with little teaching experience and their judgment likely was shaped by the cultural upheaval and proliferation of faddish cultural studies. I doubt Engineering saw as much inflation — it being more grounded in its history, slower to turn over faculty. Also, the demographics changed. The proportion of females passed that of males in the 1980s and female professors have gradually become more numerous. I don’t know if this is a contributing factor, but it’s worth considering. Grades depend on classes some teacher have higher average, some lower. The group average varies from C to B+, except when I was in a certificate in law where the average was normalised to b- for each group. As for the scholarship the student need to complete a program with success. He needs to have many fail to be expulsed from a program to the exception of some programs like medicine where the requirement are much higher. If he doesn’t, he will have to repay his burse and his loan. If he succeed he only repay his loan part (about 2500$ a year). – Abolish grades (A, B, C, D) in school, from toddlers on up through the university. When graded, pupils put emphasis on the grade, not on learning. Cooperation on a project in school may be considered cheating (!.!. Scherkenbach, The Deming Route, p. 128). The greatest evil from grades is forced ranking — only (e.g.) 20 per cent of pupils may receive A. Ridiculous. There is no shortage of good pupils. – Abolish merit ratings for teachers. – Abolish comparison of schools on the basis of scores. – Abolish gold stars for athletics or for best costume. Followed by several more pages along the same line. Your link is very funny Briggs, but I am a little surprised that the New York Times would allow such biting satire directed against Harvard. I’m sure the writer will be punished severely. The committee has decided to award the link giver an A+ with garlands. No child should be below average. It might make sense for education to be given by one branch of the university and grades by another with only first subject to student evaluations.